Standing Seam SpanLoc 300 - Central Texas Metal Roofing Supply Co., Inc.
Spanloc 300 is a structural, mechanically seamed , standing seam roof system that features a bold, trapezoidal rib appearance for sloped roof applications as low as 1/4:12 pitch, and provides excellent resistance to wind uplift. Panels are designed for application over open purlins and blanket insulation or solid substrates like plywood or metal decking. 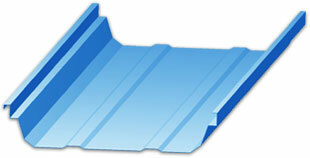 Optional floating clips offer the ability to accommodate thermal movement of the panels. Fixed or floating clip available.